At T&S Window Screen Repair and Window Cleaning, we expertly repair, replace, and install sliding patio screen doors. Our highly experienced staff use long-lasting materials and professional installation techniques to give our clients superior results. As a testament to the quality of our work as well as our cost-effective rates, we have thousands of satisfied clients, excellent reviews, and a high rate of returning customers and referrals. Custom Fit, Professional Installation. High-Quality Materials. Competitive Prices. With over two decades of industry experience, we excel at sliding screen door installation and replacement. Every door frame is carefully measured and every screen door custom fit to match it. Screen door frames are either 1¾" or 1½" wide, and feature aluminum locking mechanisms, which are stronger and easier to use than plastic ones. Our patio doors use durable wheels with bearings and feature a rubber seal to ensure bugs don't get in. We offer white, bronze, aluminum, and silver screen doors, and three types of screen mesh: regular mesh, pet screen mesh (seven times thicker than regular mesh, which helps protect your screen against damage from dogs and cats), and solar mesh (a mesh that adds privacy and blocks the sun's damaging UV rays, which helps to reduce heat transfer while protecting carpets and furniture). You can also opt to have an aluminum pet guard grille installed. To accommodate a wide range of needs, we have three sizes of guard grilles: the Super Pet Guard Grille, the Imperial Pet Guard Grille, and the Apollo Pet Guard Grille. Additionally, we can revive a sliding screen door by replacing or upgrading the hardware, seals, or screen mesh fabric. Whether you are looking to install a new patio screen door or repair an existing one, T&S Window Screen Repair and Window Cleaning should be your first call. 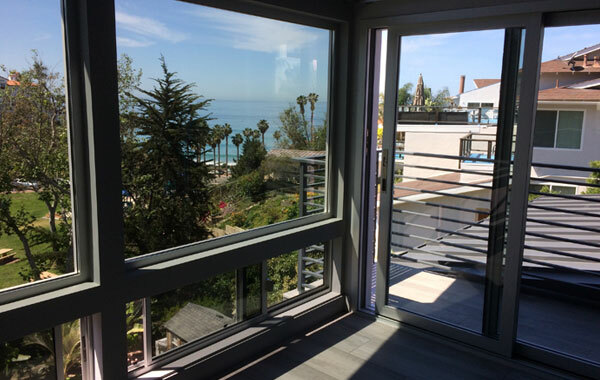 We'll make sure you get a high-quality, beautiful screen door that improves the look of your home or business and makes it easy to enjoy your view. Call us today for a free on-site estimate and fast installation. We carry everything we need on our truck, so we can often accommodate same-day and next-day requests. With a one-year warranty on workmanship, you can rest assured that our sliding screen doors will be built to last. T&S Window Screen Repair and Window Cleaning is licensed and insured. Wow! is all I can say, I called last night at 7 pm left a message, received a call right away and they were out the next day and repaired my difficult wood screen slider. It was a mess, bent frame, rollers not working, screen torn up, and within a half an hour is was new again. Very happy I called them.